This is silly but you can use fourier analysis to take microphone recordings of the server fans and predict when they will fail. A low pass filter is not a fix but what about smoothing? Yes! That’s kind of what I’m saying. 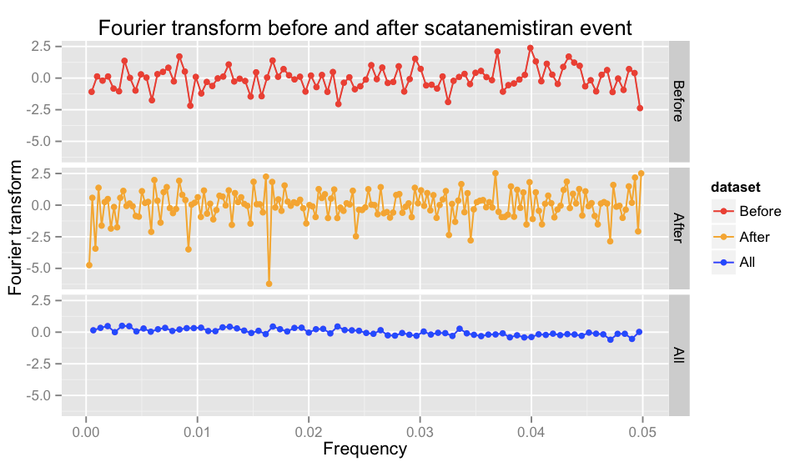 There are plenty of black-box timeseries smoothing algorithms that don’t assume your data can be decomposed into waveforms, and there are plenty that are way simpler than Fourier analysis. Mentioned it in Twitter but worth documenting here for posterity — FFTs are useful as a high-pass to remove low-frequency periodic variations (e.g. hourly, daily, weekly) and then you can back-transform to the time domain and use that as input for your monitoring tools. FWIW it shouldn’t be too much effort to instrument a few key metrics at (much) higher sampling rates, like 1 or 10Hz. (and you don’t necessarily need to persist those long term in graphite). I’m actually starting to build out a high-resolution semi-realtime timeseries buffer (1s per metric) at Vimeo, with downsampling before persisting. Re nagios flap detection being a low-pass filter. That analogy seems to make sense, although i’m not convinced it’s 100% correct. Either way it doesn’t mean we should replace flap detection by low pass filters. flap detection can use domain specific knowledge to do the right thing (alert on edge-up, etc), whereas a simple low-pass filter is more course grained and less useful for alerting. Picking a few metrics and instrumenting them at a higher sampling rate is a great idea. Let me know if you get anything good out of that. I know Vivid Cortex samples everything at 1Hz, but they haven’t mentioned Fourier analysis in anything I’ve read.